If you have a keyless car you need to read this advice, as thieves have moved with the times and have come up with a new way of taking your pride and joy. Incidents of cars being stolen with Criminals using the new high-tech ‘keyless entry’ ‘hack technology has increased. Thieves managed to enter the vehicle without damaging it or causing any alarm. Motorists are being warned to take extra care after high value ‘keyless cars’ are being stolen from driveways. Police say this also means criminals are able to avoid having to break into homes to steal the fobs. Even though reports in 2018 of this happening, and car companies we contacted were denying it, a recent Panorama Documentary showed CCTV footage gathered from various such thefts. Seeing is believing: CCTV showed car thieves with there faces covered, holding up what looks like a small satelitte dish which picks up the signla from keys left in the house, it then amplifies it to a transmitter key that that partner in crime is holding right next to the vehicle. The lights flash and then they are in the car, starting it up and driving off. All within under one minute. Most of the thefts have happened overnight and were Ford vehicles, but mercedes and other high value vehicles are being targeted. Unlike criminals’ ever-more sophisticated methods, there are a few simple measures drivers can take. A spokesman for the police said: “We believe electronic devices are used to mirror the signal of the keyless car fobs. ”The advise to owners of keyless cars is to buy a Faraday bag. The bag acts as a key signal shield to help protect owners from having their cars stolen. 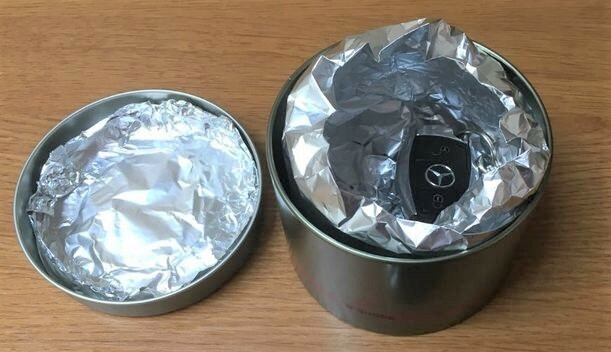 You can also store fobs in a metal tin, or wrapped in alluminum foil. We phoned hartwell ' skyford to see if they had one of those 'faraday' key fob covers that would sheild it from sending out its signal. But they did not have any such thing. We were told we could disable the keyless entry via the menu system, which meant having to use the old fashioned key, which after paying the extra for the new system, we felt a refund would be needed for a nsecure system. They did comment that they were unhappy they couldnt help, so they passed us the the number for the main Ford offices which we wil be calling soon. Continental’s Key as a Service (KaaS) technology solution allows for two-way data communication between a vehicle and Avis Budget Group’s cloud-based system and app, which effectively “connects” the car.